Tolosa, located about twenty miles south of San Sebastián, in the Basque Country, becomes lively on Saturdays, the town’s market day. People from all over the area flock there for the exceptional local produce. The dried red beans of the region are particularly flavorful and thus highly prized. 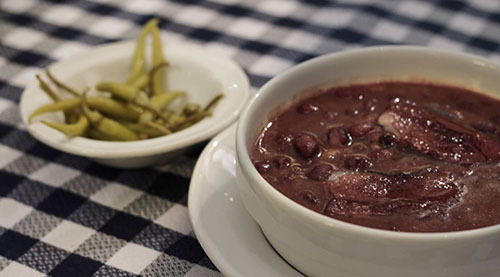 If you should visit Tolosa one day, seek out one of the numerous bars or restaurants there that serves this red bean stew, which is traditionally accompanied with the spicy-hot pickled peppers known as guindillas. 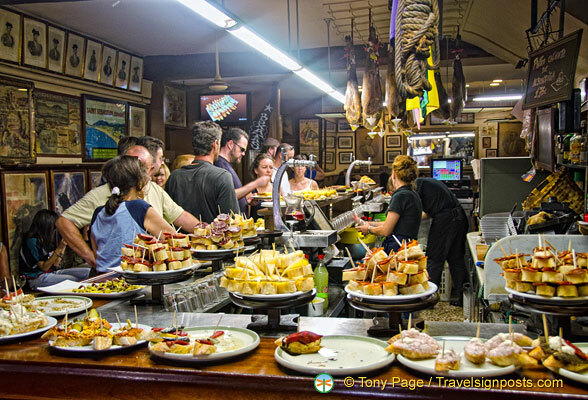 My favorite place to eat it is Herriko Etxea, a tavern in Albiztu, only minutes away by car from Tolosa. These famed dried red beans, as well as dried white ones, are called alubias in the Basque Country and in neighboring areas in northern Spain. 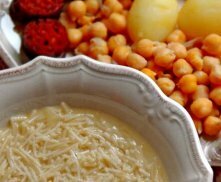 In the rest of the country, however, dried beans are usually called judías, literally, “Jewish.” I find it surprising that lubia, Arabic for “bean” (al is the article), is used in precisely those parts of Spain where the Moors had relatively little influence— a curiosity for which I have no explanation. Rinse the beans in a colander under cold running water. Place in a bowl, add water to cover by 2 inches, and let soak for at least 8 hours or up to overnight. Drain the beans, place in a stockpot, and add water to cover by 1 inch. Add 2 tablespoons of the olive oil, the onion, and the salt pork and bring to a boil over high heat. Decrease the heat to medium-low and cook, uncovered, at a gentle boil, stirring occasionally. After the beans have cooked for 1 hour, add the chorizos. Add warm water if needed to keep the beans covered, and continue to boil gently for 1 hour longer, or until the beans are tender. Meanwhile, in a saucepan, bring the 6 cups water to a boil over high heat. Salt the water lightly, add the cabbage, and cook for about 20 minutes, or until the cabbage has lost its volume. Decrease the heat to medium, add the morcillas, and cook for 20 minutes longer, or until the morcillas are fork-tender. Lift the sausages from the pot and keep them warm on a serving platter. Drain the cabbage, squeezing it thoroughly to eliminate any excess liquid. In a sauté pan, heat the remaining 4 tablespoons olive oil over medium heat. Add the garlic and sauté for 2 to 3 minutes, or until golden. Add the cabbage and turn several times in the oil and garlic to heat through and blend the flavors. Transfer the cabbage to a serving platter and keep warm. Transfer the beans to a warmed serving bowl and place on the table along with the platter of sausages and salt pork and the platter of cabbage. Offer the guindillas on the side. These spicy-sweet little peppers are a favorite treat in the Basque Country. They are a favorite with guests. We find that they disappear very quickly and pair perfectly with a good cheese and a crisp white wine. TThese delicious plump chorizos follow the traditional style of home-made chorizos from Spain. Their smoky flavor comes from the famous pimentón de La Vera, smoked paprika, that lends its flavor to all Spanish chorizo. Garlic and other spices add a complexity to this free-range pork sausage..